Virginia Rieger Denton ’61 oversaw great change on Syracuse University’s physical campus during her years with the office formerly known as Design and Construction through her various roles, including as director. But it was the development of a special place of honor that she may have been most proud. Following the terrorist bombing of Pan Am 103 in 1988, Denton and then-Chancellor Melvin Eggers formulated the design and development of the Place of Remembrance to commemorate the 35 SU students who died on the flight. Denton, who passed away on Oct. 27, knew the campus and its footprint—and its people—profoundly as a professional and as a valued colleague and friend to many over her decades with the University. Denton, who was born in New York City and grew up in Syosset, New York, graduated from SU with a degree in design. She took a position in the University’s Office of Design and Construction, where she went on to serve for 42 years. 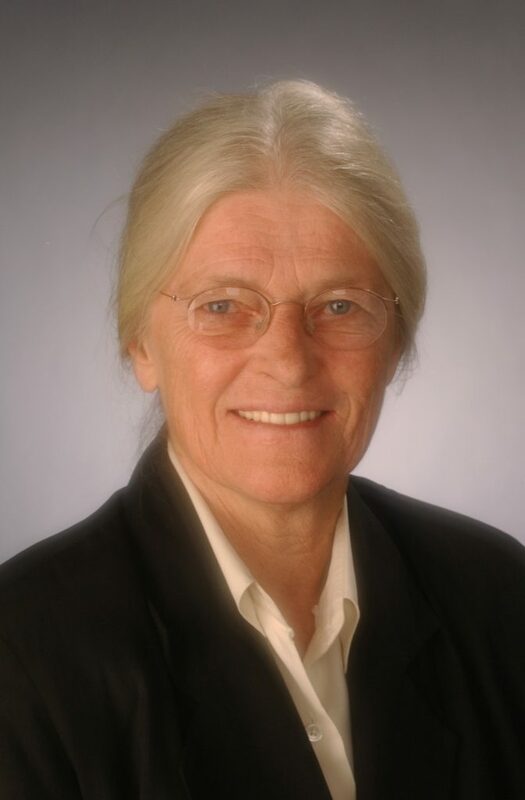 In 1986 Denton was appointed director, becoming one of the first women to oversee new construction, renovation and major maintenance of all facilities for a major university. “Ginny was fiercely committed to her stewardship role on campus. Over the years, she touched every building,” says Brenda Law, architect and assistant director of design in CPDC, who worked with Denton. During her tenure, Denton developed the Campus Master Plan, which included the removal of paving and parking from the campus center and the establishment of more green areas and both the Sculpture Garden the Orange Grove. She also worked on the design and development of the Carrier Dome. Other projects under her direction included the Schine and Goldstein student centers, the Shaffer Art Building, the Comstock Art Facility, the Center for Science and Technology, Flanagan Gym, Crouse-Hinds Hall, MacNaughton Hall and additions to the Manley complex. She oversaw major building renovations, including the Hall of Languages, the Tolley Administration Building and Crouse College. “She saved Steele Hall from demolition by creatively renovating it for what the proposed demolition would have cost,” Law says. For her devoted work and commitment to the University, Denton was awarded the Chancellor’s Citation for Distinguished Service in 2004, and she received the Distinguished Alumni Award from the College of Visual and Performing Arts in 1991. Denton, who retired in 2003, had an honesty, a strength and a grace about her that were all the more important to help her through the challenges of being in a predominately male field, especially in the 1960s and 1970s. Heaphy called Denton a “positive force” for the growing number of women architects and designers in the office—and for all of her staff. “I’m a better person for being around her,” he says. Heaphy, who started in 1972 as a project engineer and later became head of engineering, was in roles that put him in second or first command under Denton. He was inspired by her design knowledge, her concern for those who worked in her unit, her determination in her convictions and her solution-oriented style. In a meeting involving the development of Eggers Hall, Denton made a bold suggestion about its placement—move Holden Observatory about 400 feet to make room for the new building linking to Maxwell Hall. It involved moving all 300 tons of the observatory. “She would say ‘let’s find a solution; there isn’t anything we can’t do,’” Heaphy says. He also noted she was adamant about not tearing down buildings but restoring their uniqueness and the historic value they brought to campus. Denton was predeceased by her brother, Professor James Rieger; her cousin Janice Tack; her longtime friend Antje Bultmann Lemke; and her dear cat, Choe. She is survived by her cousin Marjorie Borg and many other cousins. Calling hours are Friday, Nov. 2, from 5 to 7:30 p.m. at Eaton-Tubbs Fayetteville Chapel, 7191 East Genesee St. A private gathering and burial is being planned.